Of the many causes, skin allergies are considered the most common cause for itching. Other causes like fleas, mites and a lice infestation may also cause itching. Dogs affected with dermatitis, folliculitis & severe secondary bacterial infections of the skin may itch and scuff. Dog Atopy; Atopy is a seasonal allergy, which may be due to fungal spores, pollen, dust and grasses. An affected dog may lick, scratch and chew its feet, legs and flank (between the pelvis and last rib). Hypersensitivity; Many dogs are hypersensitive genetically or physiologically. The most common example is that of flea bite hypersensitivity. The immune system of various dogs may respond violently to body cells, especially skin tissues due to hypersensitivity. Common signs are that of redness, sporadic alopecia (hair loss), inflammation and scratching. Dogs That Itch and lick The Rump or Just Above the Tail May Have Fleas. The change of Hair Color to Red is Caused by Licking. Dog Food Allergy; Various foods, mostly commercial foods contain artificial contents like food colors, artificial preservatives & edibles which surely cause food allergy. Along with itchy skin in dogs, swelling of facial tissues, redness, vomiting, diarrhea & sometimes acute bloat are some common representations of food allergy. Various species of mites, fleas, lice, ticks and flies may cause itchy dog skin. 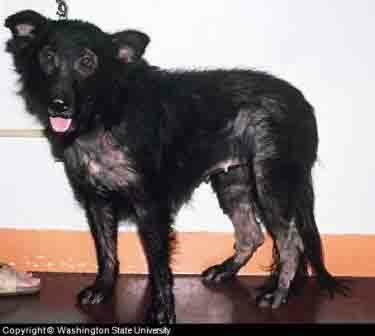 A mite infestation may lead to clinical mange, which will surely cause severe dog skin itch. 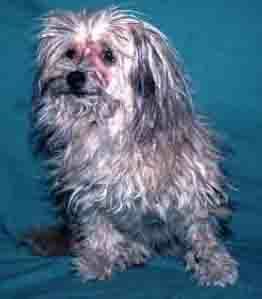 In red or Demodectic mange, the skin becomes reddened, swells and severe itching is noted. A contagious form of mange, walking dandruff, is another example of mange which can result in the severe itching of skin. Fleas are another cause for itching. Chronic cases of flea infestation may result in severe folliculitis (inflammation of one or more hair follicles), causing alopecia (hair loss), itching and inflammation of the skin. Lice and ticks can cause itching but it is rare in dogs. Itching is less common with restlessness as the dominant symptom for lice and tick infestation, especially in long haired dog breeds. Various bacterial and viral species may cause itchy dog skin directly or indirectly. Pyoderma is one of most common conditions, in which the skin infection may lead to pus beneath skin & severe superficial skin itching. Similarly in puppies, canine distemper infection causes itchy canine and irritation, depending upon the severity of the infection. Itchy skin alone cannot indicate a diagnostic approach since itching is triggered by various predisposing factors. Hair loss or alopecia may be one such factor for itchy dog skin. Once the alopecia occurs, the follicular base of the hairs become involved, which irritates the nerve supply in the base of the follicular tissues, which leaves the skin itching. Pyodermal infections (puss containing skin infection) and severe dermatitis may cause the hardening of skin tissues, which once they start to scale, may trigger itching. Inflammation, skin rashes, bruising, crusts, swelling and sometimes dermal lymphatic cell proliferation (cells that help prevent infection) may also lead to itchy dog skin. Treating itch symptomatically can never be useful. Itching due to allergies can be suppressed using non inflammatory steroids, but it may cause other complications too, like those of renal disturbance (kidney) and obesity of dermal cells. Similarly, use of anti-histamines for itching is helpful as a repeated treatment, but can never be an alternative to systemic therapy (treating the underlying cause). A logical diagnosis and then systemic therapy is required to not only treat itching in dogs but also to cure conditions which causes itching. Pyodermal infections and dermatitis can only be treated with antibiotics, along with the topical management of symptoms using dips and bathing with quality shampoos such as PetAlive Herbal Shampoo. Similarly, a sulfur–lime dip such as Naturasil for Pets along with administration of anti parasitic drugs are required for treating parasitic infestations, causing itchy dog skin. Dogs having itchy dog skin due to food allergies may be fed with hypoallergenic diet along with care in selection of food. Products containing milk, animal proteins & vegetables protein should not be given to such dogs. Oatmeal Shampoo: A bath using this an oatmeal shampoo such as PETCO Oatmeal Medicated Dog Shampoo can bring some quick itch relief to your dog. Itchy Dog Paws: To soothe itchy dog paws consider a bath using Epsom Salts. Fill tub with a few inches of cool water and add 2 cups of salts. Soak for 5 to 10 minutes. Moisturizer: Use a gentle moisturizer as a home remedy for canine dry itchy skin. Dilute a moisturizer such as Avon SKIN SO SOFT or Alpha Keri Body And Bath Oil at one tablespoon per gallon of water. Lightly spray on dog after bath or use as a rinse at the end of a bath. Over the Counter Antihistamine: For season allergies Benedryl (diphenhydramine) could be given to dogs under the dosing guidance of a veterinarian. The usual dosage is 1 to 3 milligrams for every pound the dog weights. A anti-histamine should be given throughout allergy season as recommended by a veterinarian.